Friday evening, 5 May, just after 6pm. I dashed to the library before it closed, and after leaving the library intended to have a wander in town, maybe sit in the sun and watch the world go by. But town was too busy, and all the sunny benches were occupied, so I headed here to Scarborough Bridge, where there’s a suntrap of curved corner from the bridge supports on the riverbank, and a bench where you can sit and make the most of the late sunshine. 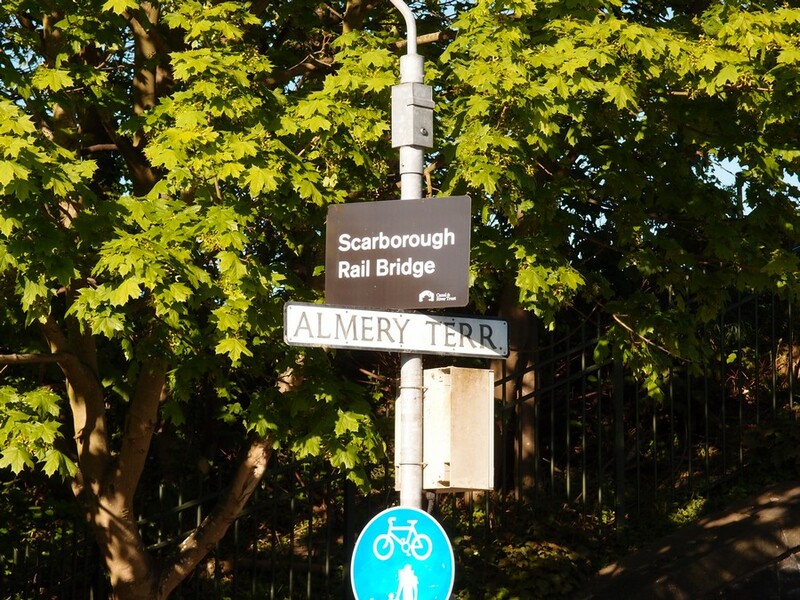 So here we are, on a bench by Scarborough Bridge. Not a glamorous location, but a place I know well. And not the first time I’ve written a page inspired by sitting on a bench. It can be quite difficult sometimes to get these pages to a stage where I can hit the ‘publish’ button. Sometimes I don’t feel like writing, sometimes I feel like writing but not about York, sometimes there are so many things I find myself thinking about that it’s hard to decide what to focus on. 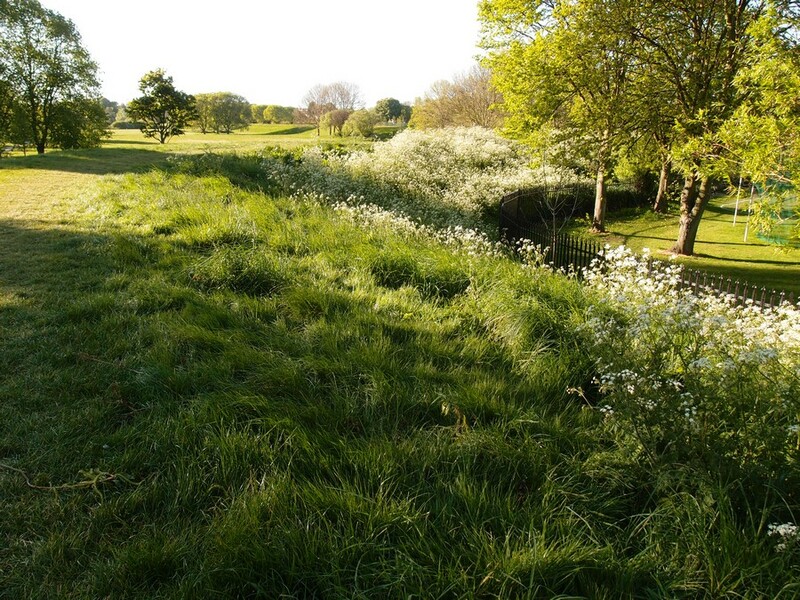 This week I thought about writing about Bootham Stray, or Baile Hill, or Bootham Park. Two of them seemed too complicated for a web page, one of them seemed too depressing. So I sat by Scarborough Bridge, rather overwhelmed by complexities and different perspectives, and having thoughts too complicated to share here, and then after a few minutes the sun warmed me up and the people passing by on bikes and on foot looked cheery, and a dog stopped and stared at me and its owner said hello and smiled. And then I heard the cooing of the pigeons and looked at the light on the stone and thought I’d start from here. When in doubt, start from where you are. So I looked, and listened, and paid proper attention. Then took some photos, then walked towards home, and took some more. 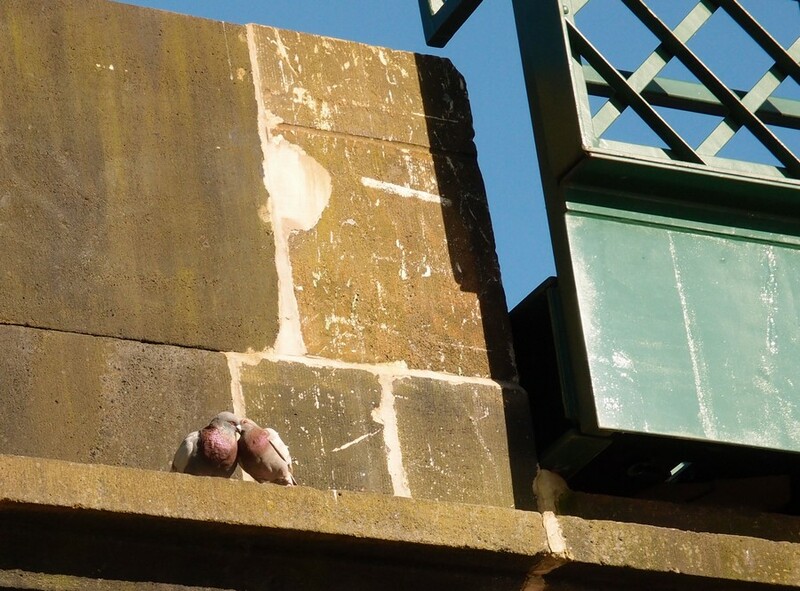 The pigeons up on the bridge were enjoying the evening sun, gently cooing, and courting, doing that nuzzling of the necks thing that pairs of pigeons do. 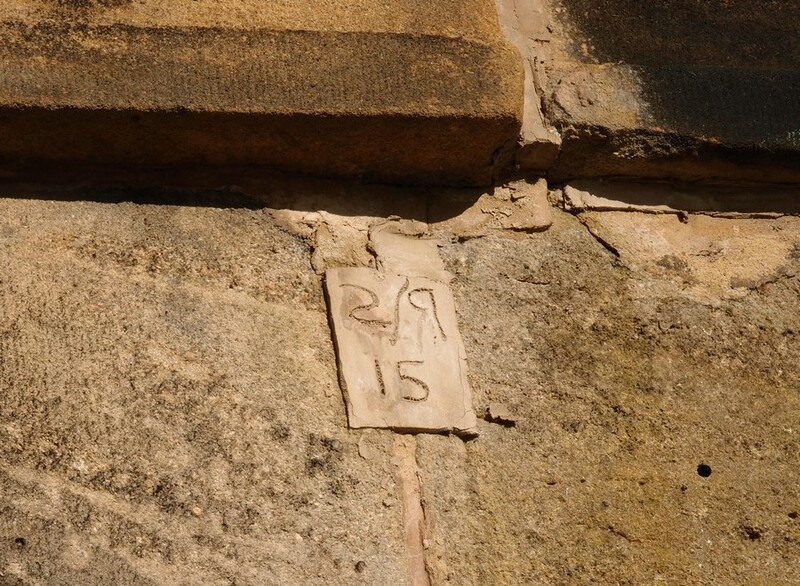 The sun also highlighted numbers in mortar on this side of the bridge’s stonework. 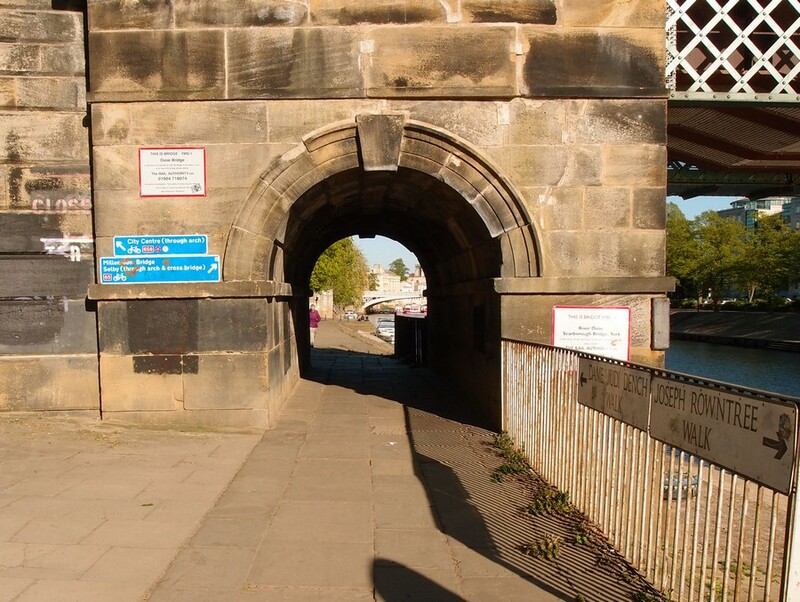 It appears to be a date, and is perhaps connected to the repairs to the bridge a couple of years back, which I wrote about at the time. 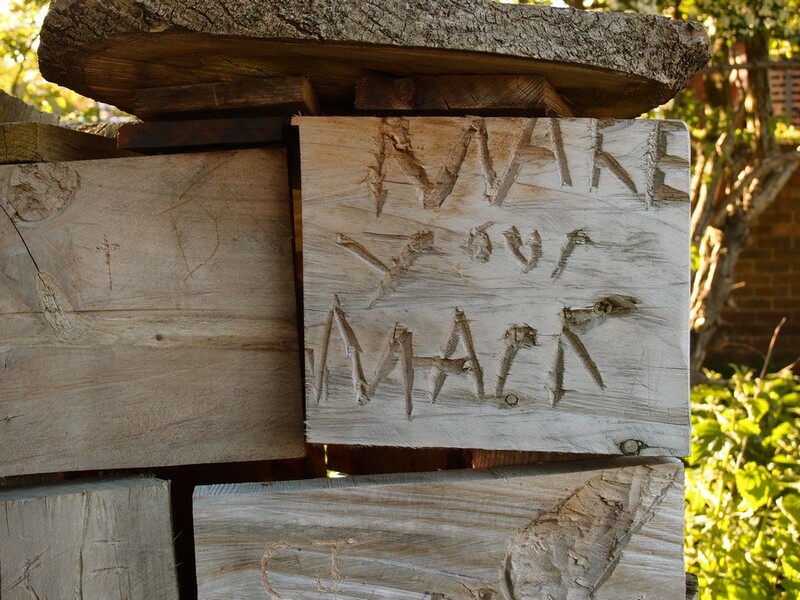 Perhaps a signature of work done, like a modern version of a mason’s mark. Or perhaps not. Interesting anyway. They signify something, obviously. There are many signs here in this small corner. Confusing to see this bridge named ‘Ouse Bridge’, on Network Rail’s sign. Ouse Bridge is the road bridge a bit further down. Just one example of many I’ve seen of Network Rail’s strange and confusing signage. 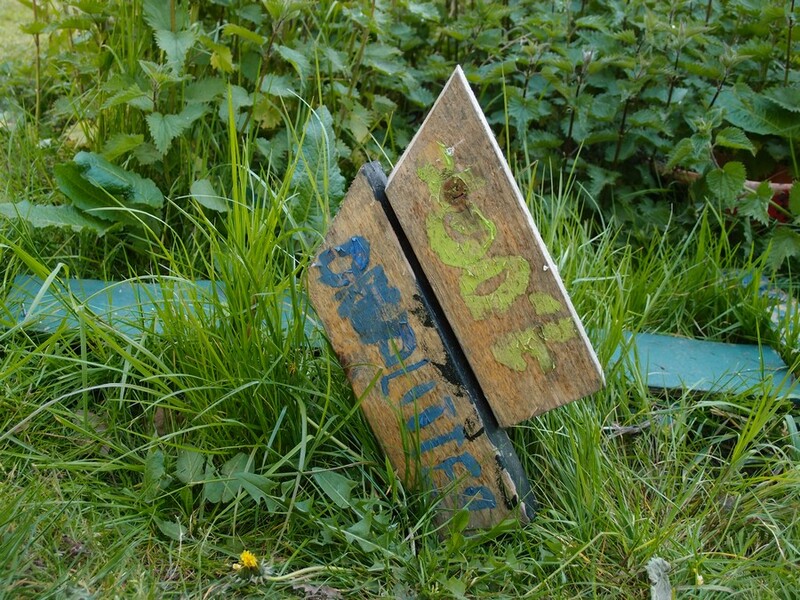 A few metres away, on a post, there’s another sign, from the Canals and Rivers Trust, calling it by the name most of us know it as. 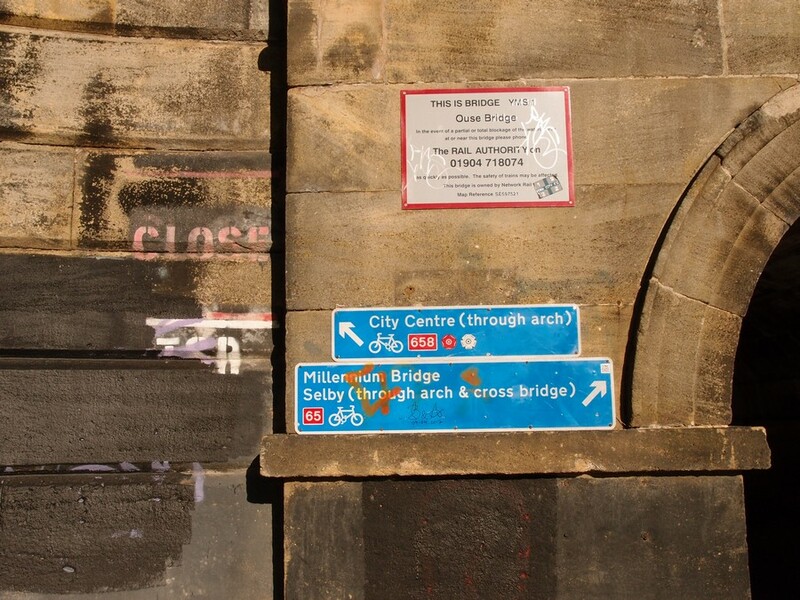 And then on the railings these two signs, denoting named sections of the riverbank. I’ve never understood these. 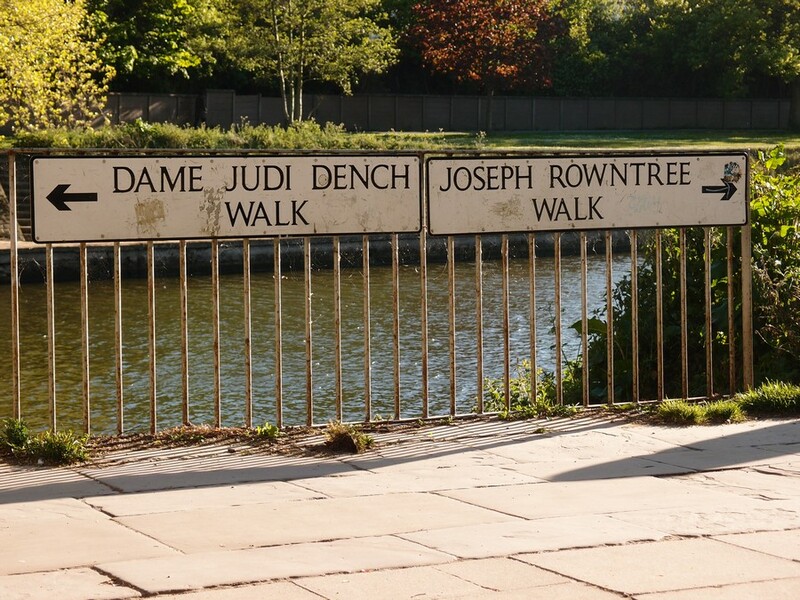 Why are two apparently random sections of riverbank named after famous York people, and more importantly, why does that need two massive great ungainly signs, alongside so many signs already? Are there similar ‘walks’ at the other end of town? 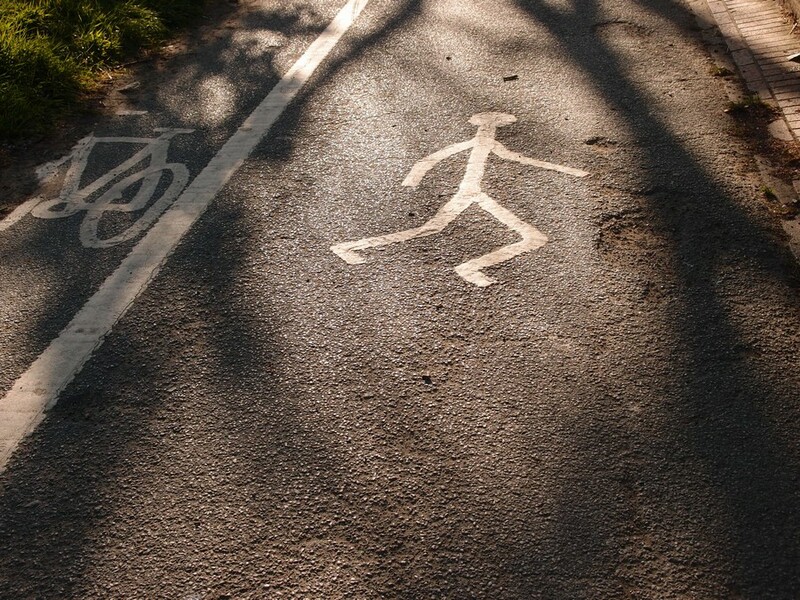 A Frankie Howerd walk? Among all that modern metal signage and railing is a very handsome piece of ironwork from an earlier time, which manages to be both sturdy and elegant. The bench I was sitting on. 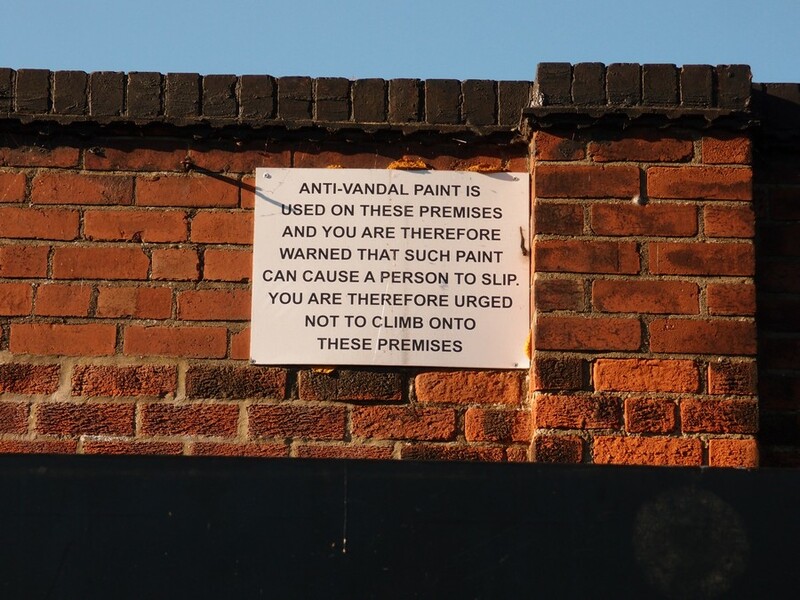 I perhaps shouldn’t point it out as that might encourage the Civic Trust to come along and paint it. Many things are fine and dandy just as they are, and this is one example, so I hope they leave it alone. 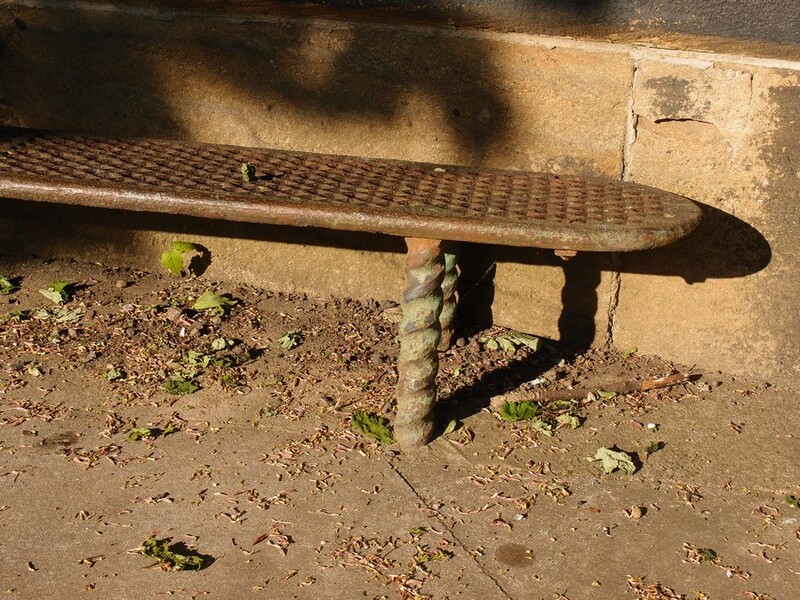 There’s a similar bench on Wigginton Road, on the approach to the junction with Crichton Avenue bridge. I’ve never seen anyone sitting on that one, maybe that could be painted instead, to draw more attention to it. Anyway, enough sitting about idly looking at signs. Fancy a walk by the river? Off we go, heading out of town. As this is a path shared by pedestrians and cyclists we might have to go in single file or in twos, if there’s loads of us. We are ‘urged’. I’ve never had the slightest inclination to climb onto this building, but now they’ve made it sound so exciting, with their urging, I feel like I want to. 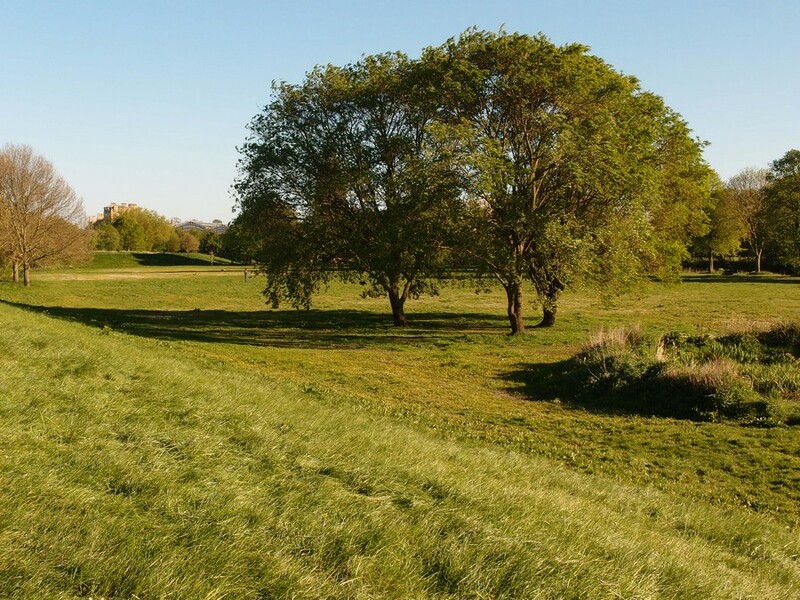 But let’s proceed onto the gentle slope of the floodbank instead. I’ve walked along here many times, but perhaps not before from this direction when it happened to be reaching springtime perfection. It made me stop and stare. 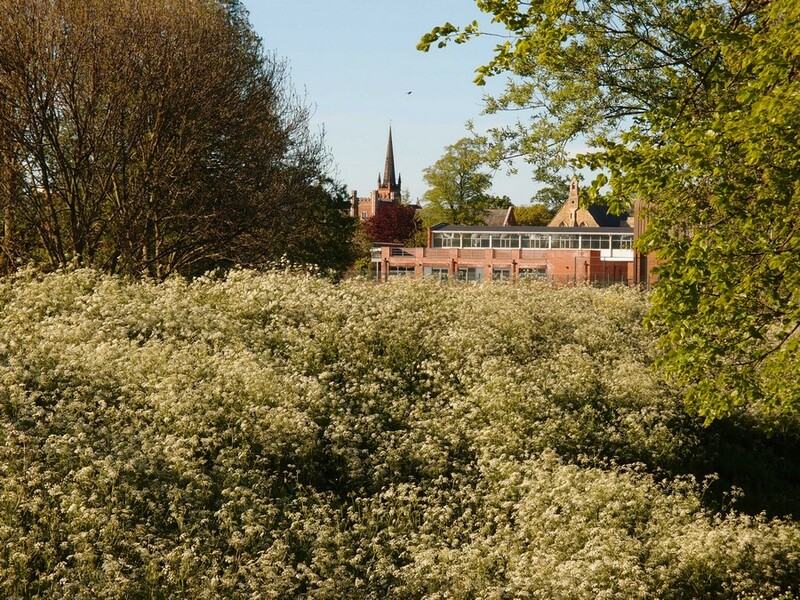 Covering the side of the floodbank facing away from the river, great billowing mounds of cow parsley. Behind it the buildings of Clifton, including the landmark spire of Clifton Methodist Church. Looking back to where we’ve just been, over playing fields and housing, that apparently redundant boathouse looks like it would be a really good place for a pedestrian and cycle bridge to land, as described in my imagined perfect York, a few months back. But back to the present, and following the floodbank out of town, and looking over towards Clifton. The more I walk, the more areas of interest I find. 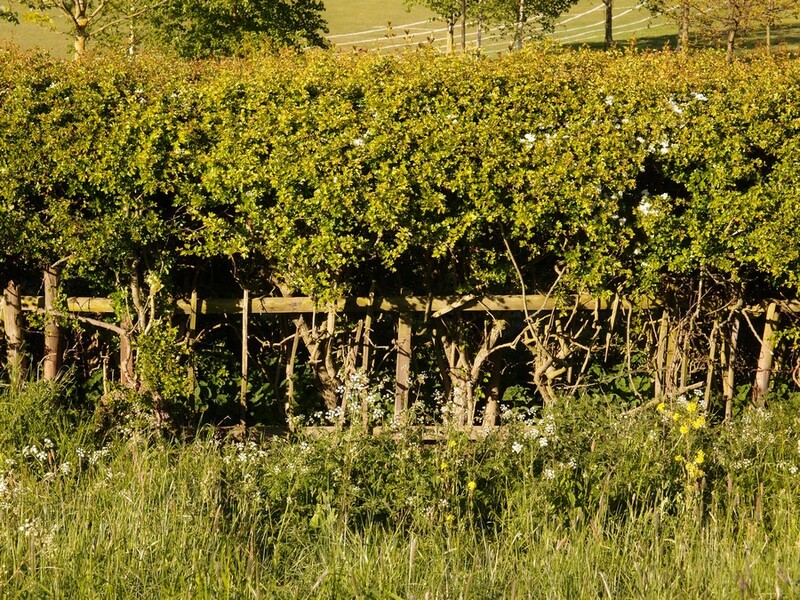 Currently I’m very interested in hedges, particularly the old gnarly ones. This hedge is quite interesting, and looking handsome with its new green growth. And then I spotted what looks like a gate in the middle of it, never noticed it before. 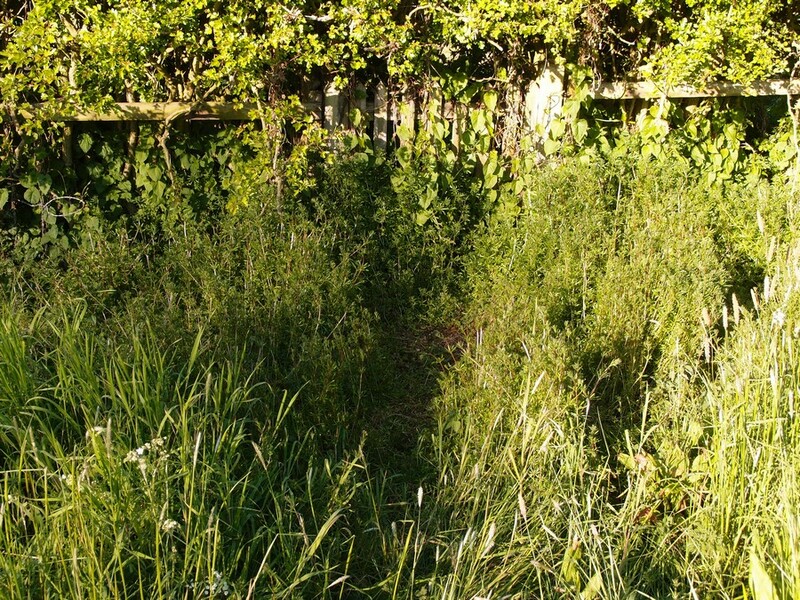 It’s small and wooden and overgrown and no one’s been through it for years, but there’s still a trace of a path worn in the ground leading up to it, through the sticky weed. 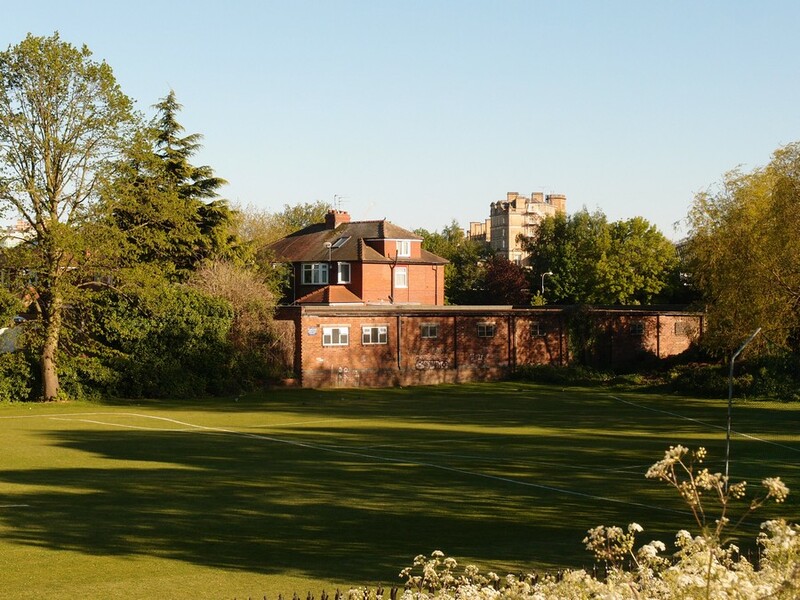 It would have led to the ings from the grounds of Queen Anne’s school (which is still there but now St Olave’s School). I wonder if anyone out there remembers using it. Further along, as I walked, a robin moved along the hedge. I remember hearing, and recording, a robin singing here, in this hedge, one December, some years back. 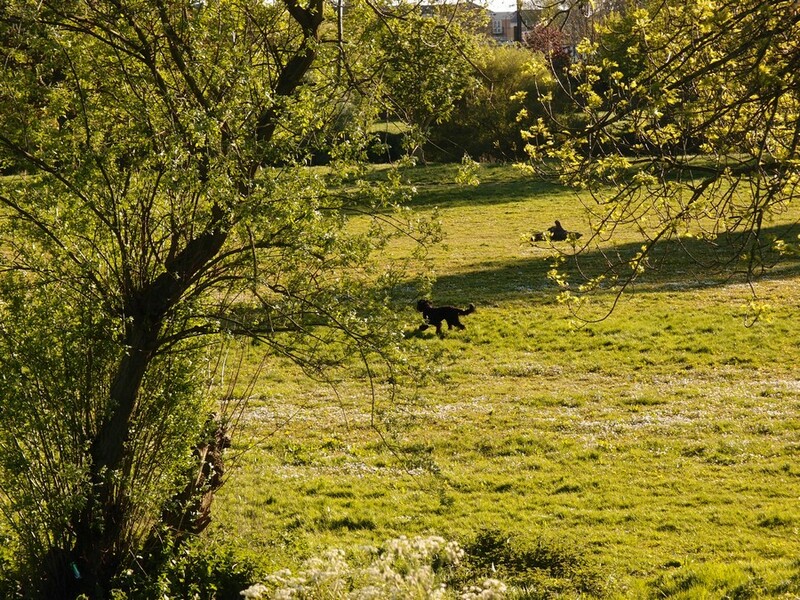 On the flat lands of the ings, on the other side of the floodbank, dogs were chasing sticks. There’s a new pond here, in an area where there was a bit of a depression in the ground already. I read somewhere, I think in a letter in the Press, that the sunken ground had been the result of a bomb dropped during the air-raids in the Second World War. If that’s true, I wish it had been left as it was. But it might not be true. I haven’t had chance to investigate. But I do know that this area is/was known as ‘Paddy’s Pitch’. Beyond the pond on Paddy’s Pitch is a group of three trees I first took a photo of in December 2004, on the winter solstice. They’ve grown a bit since. 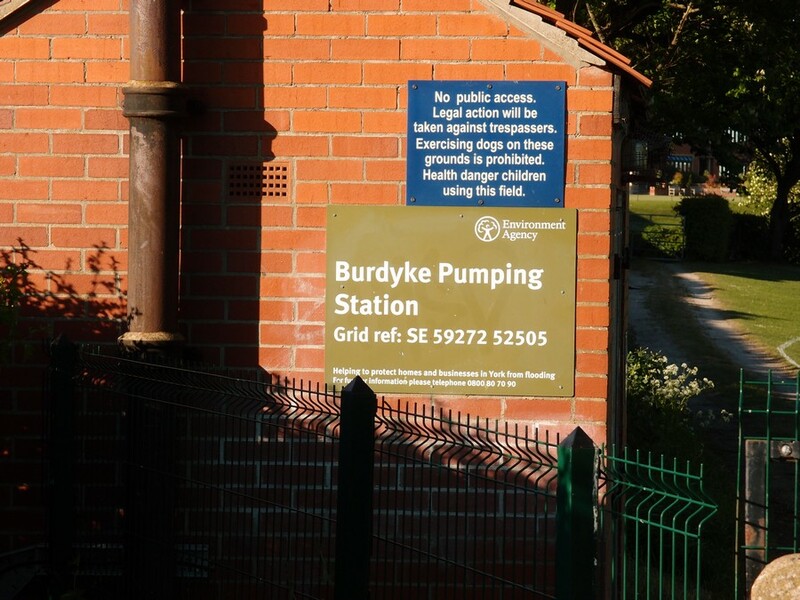 I’m quite fascinated by the old Bur Dyke, and wrote about it early last year, after it bubbled up in the floods of late 2015. Halfway along there’s the place where a fantastic horse chestnut used to be, though you wouldn’t know it from the rough patch of earth left behind, unless you’d seen it and remember it, as I do. 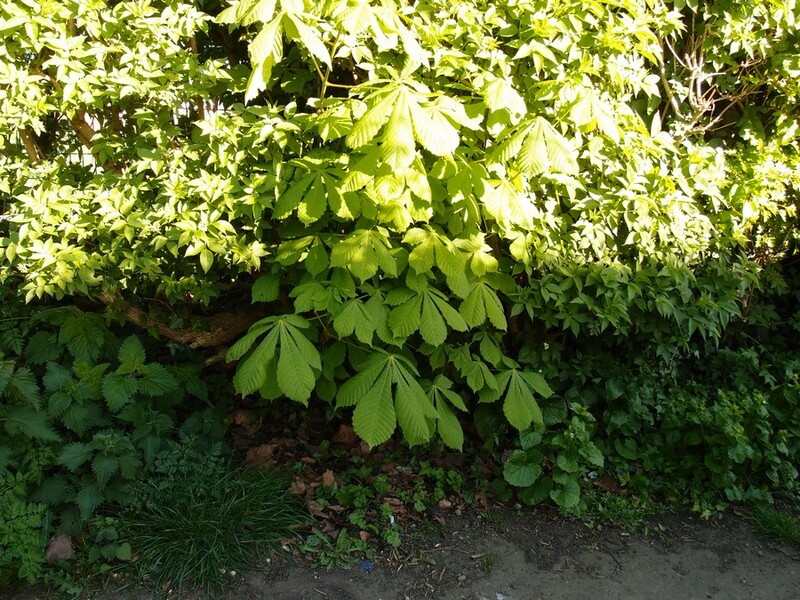 And while remembering it, I noticed that springing from the hedge bottom a metre or two away is a young horse chestnut, all green and vigorous. Maybe from a conker the old tree dropped. 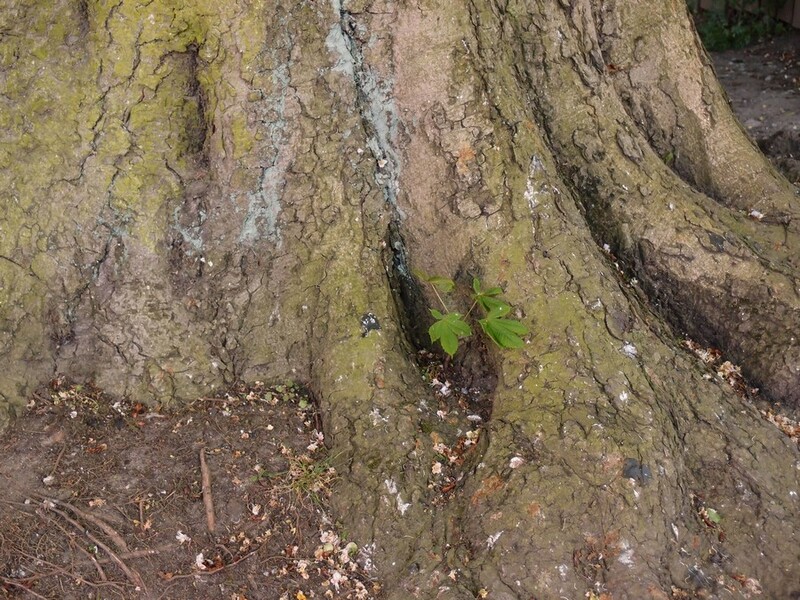 Then after another short distance the hedge ends, and standing there in isolated glory is another horse chestnut, a huge thing, which I’ve admired often. 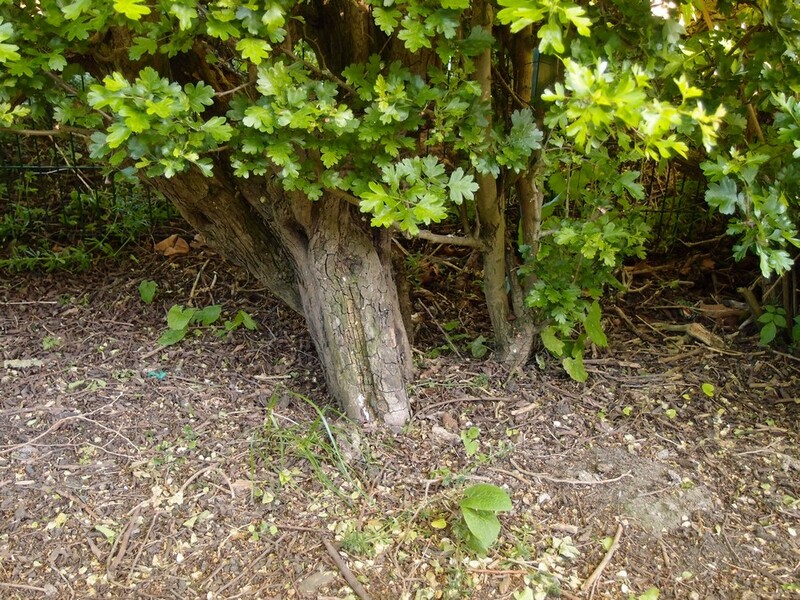 I realise it’s on the line of the hedge and wonder if it started its life in that hedge. 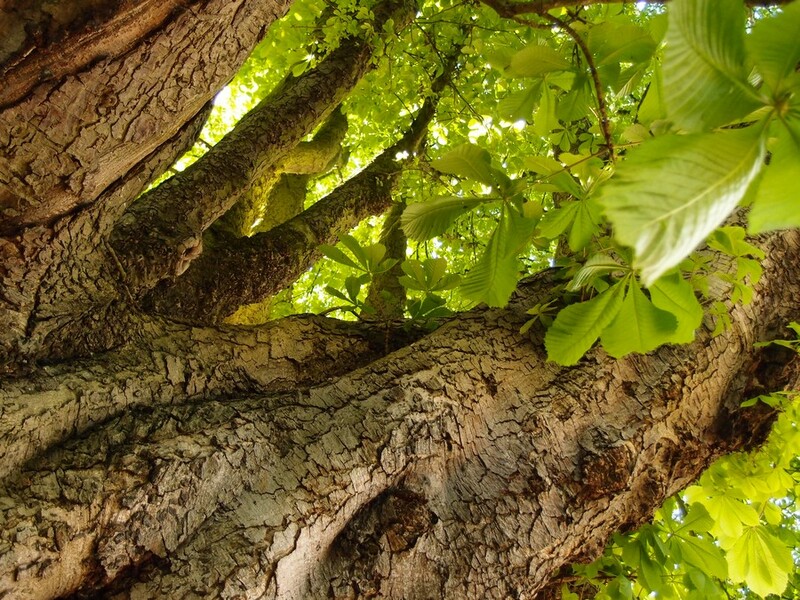 At the bottom of its vast trunk is a tiny version of itself, nestled in the folds of its foot. Still on the course of the culverted Bur Dyke we then arrive at a triangular piece of land between snickets. 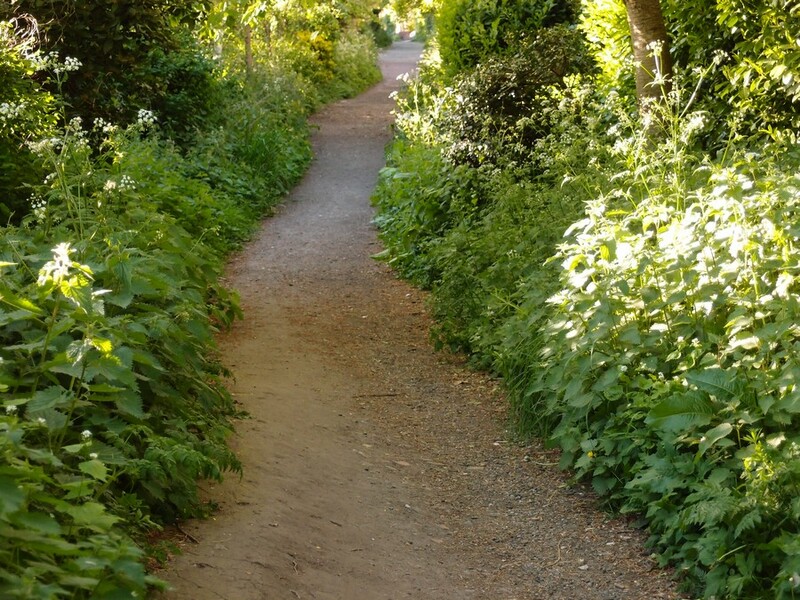 One of the snickets is an ancient path, heading from Marygate to Clifton Green. I wrote about it on one of my 2004 York Walks. 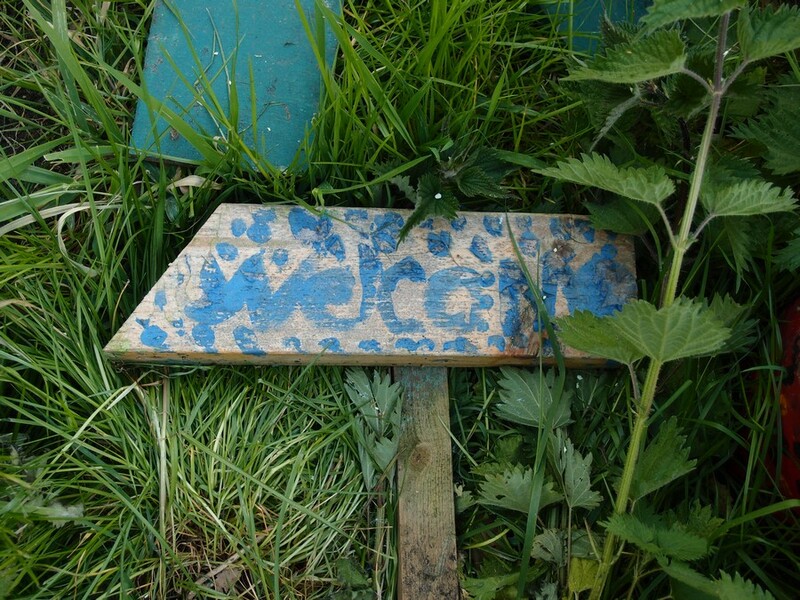 In the corner, by a patch of nettles, more signs, which I couldn’t make out at first. 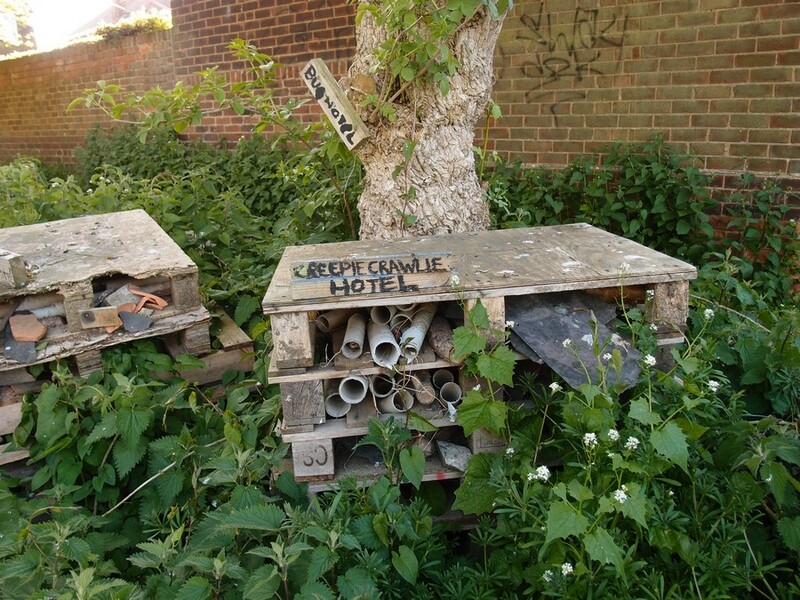 One said ‘Welcome’ and the other has an important message: ‘Don’t drop litter’. Then I stood and looked back at the huge horse chestnut, with the light behind it, near a gate to the playing fields and with the ings beyond, and was struck by how this looks almost rural. Or it might, if it wasn’t for the ‘no parking’ signs and bollards to prevent parking. 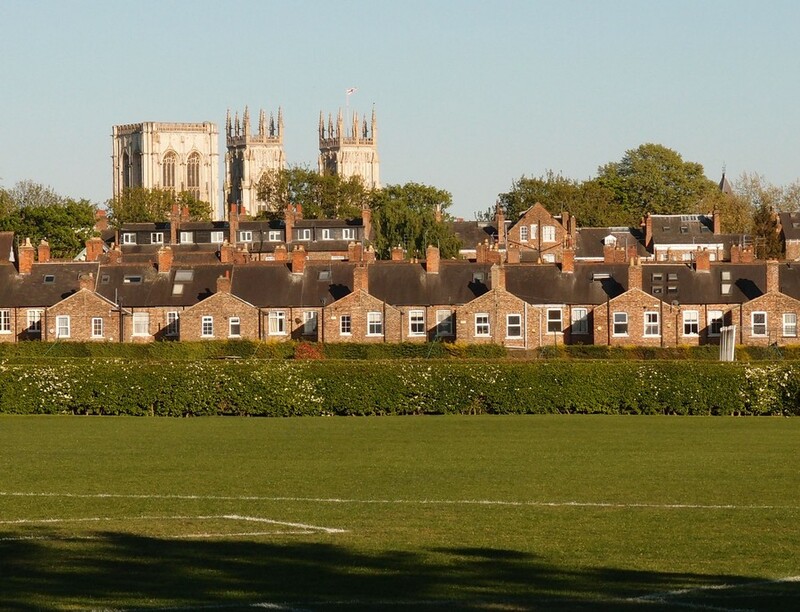 At the other edge of the triangle of grass, through a gate at the edge of school playing fields, looking back towards town, we have a fine view of the Minster over the back of Victorian housing on North Parade. 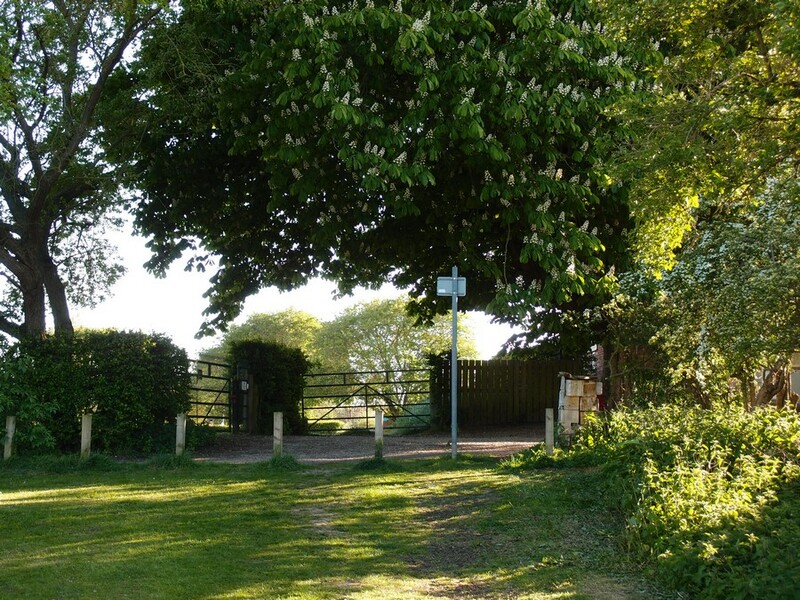 If we then continue on the line of the old snicket, on the line of the old Bur Dyke, it takes us to Clifton Green. Maybe a walk for another time. Thank you for your company. Please remember to take your litter home, and please feel free to pick up everyone else’s litter while you’re at it. Thankfully this springtime greenery has hidden most of it from sight. Google map of route and some of the features mentioned above. Sometimes we go for a jolly jaunt like this one, sometimes we sit and ponder, sometimes we carefully observe council meetings, or follow planning applications planning the demolition of less well-known heritage assets. 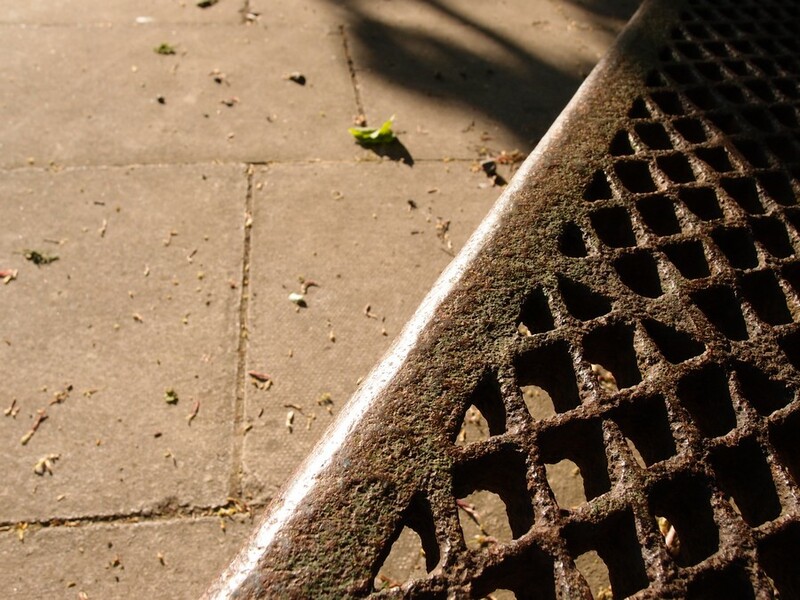 Sometimes, many times, we’ve noticed things that have led us into investigations of local histories and this has led to a wealth of local knowledge and memory of place not recorded elsewhere online. Just one person writes the pages, takes (almost all) the photos, and looks after the site. It’s a valued online resource, and I’m glad I’ve been able to keep it online for so many years. It’s now powered by your gifts of virtual coffees. Recent coffees and kind comments have been much appreciated, and powered this week’s local exploration. Thank you. Pages now usually appear weekly, on Tuesdays. For notifications of new pages appearing, join the mailing list or follow me on Twitter. All those fragile details make a place matter. It’s a pleasure to virtually share it with you. I too am uplifted by this journey in the Clifton ings area.’A lovely up beat walk, thro’ a riverside place I knew well,in my day,Alleviating gloomy/boring/ /repetitive pre election hype Thank you Lisa. This is a delightful and beautifully written piece about your walk. It’s uplifting and almost transcendental. I felt quite relaxed and refreshed after reading it. So pleased that it conveyed what I hoped it would, really appreciated your thoughts in response. Just sorry that I couldn’t also convey the scents and sounds – cow parsley and birdsong – but hope you have access to those sounds and scents in the places you’re in. I think that you’re all living somewhere else now – AndyT, drake, Stephen and Ludger – I really appreciate that you still care about the old place.